Bulk cargo or RORO shipping. semi-trailer. Low bed semi-trailer,Container trailer. semi-trailer truck trailer.Pink tank semi trailer. Split gooseneck trailer, semi-trailer. Customer satisfaction is the goal we have been pursuing. 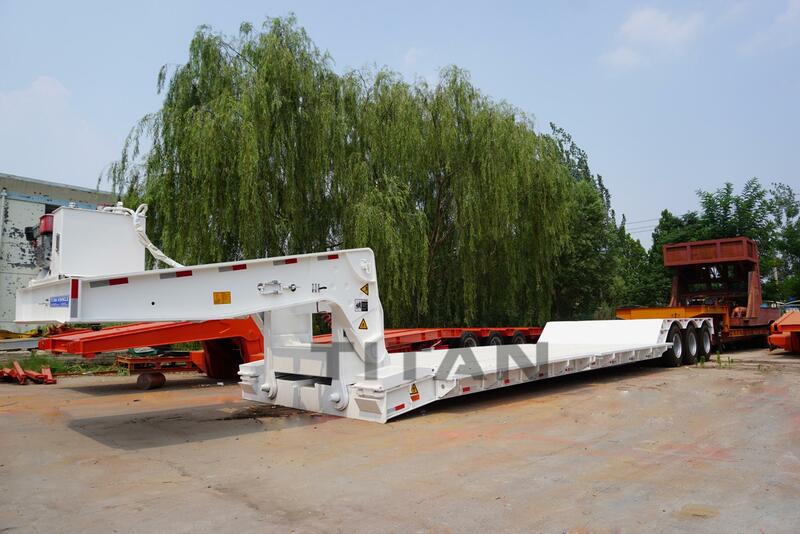 TITAN Detachable Gooseneck Lowbed Trailer with 80 ton loading capacity which is the best trailer to transport transport construction machinery, like crawler, crane, excavator, crawler loader and other crawler machinery. 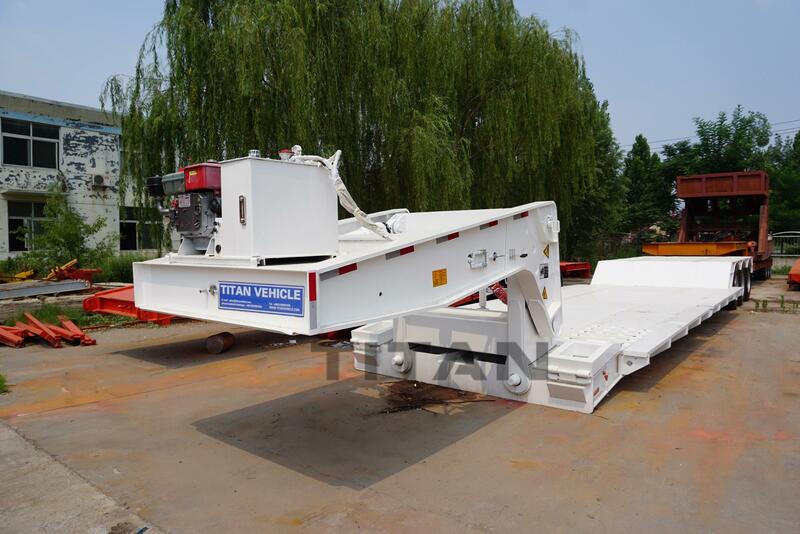 With the low loading platform and voluminous loads trailers are in great demand, TITAN detachable gooseneck lowbed trailer is the best solution for your transportation needs. 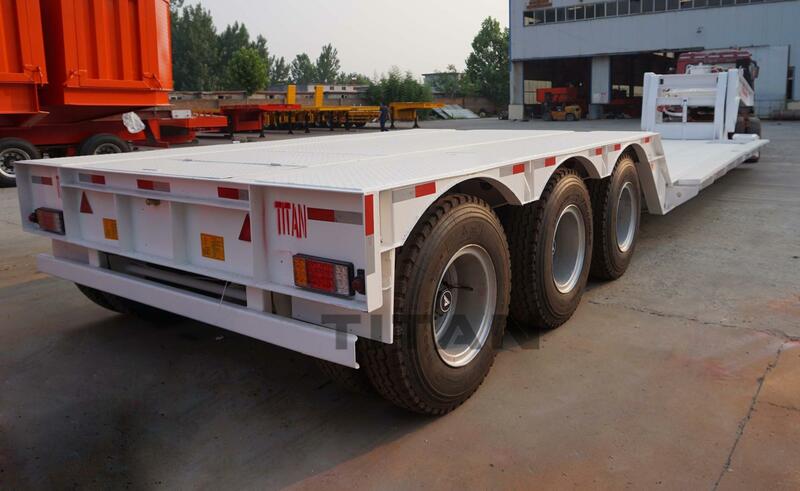 TITAN detachable lowbed trailer are noted for their highly robust structure steel and high loading capacity from 60 ton load capacity to 150 ton load capacity. 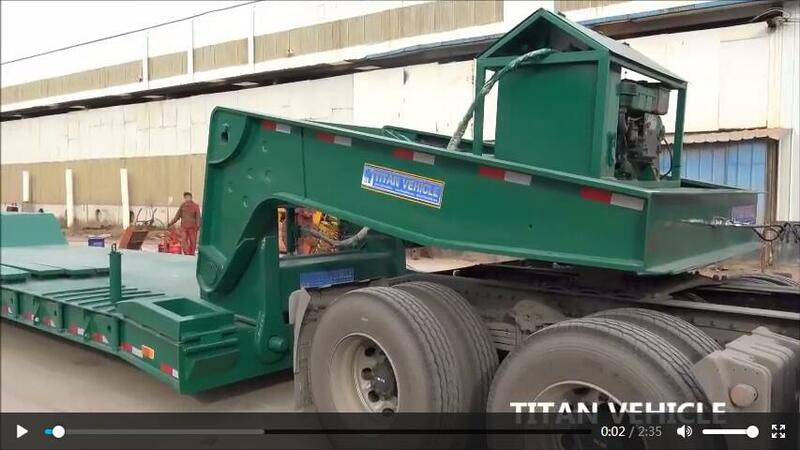 TITAN can provide you the customize detachable lowboy trailer to meet your transport requirements. 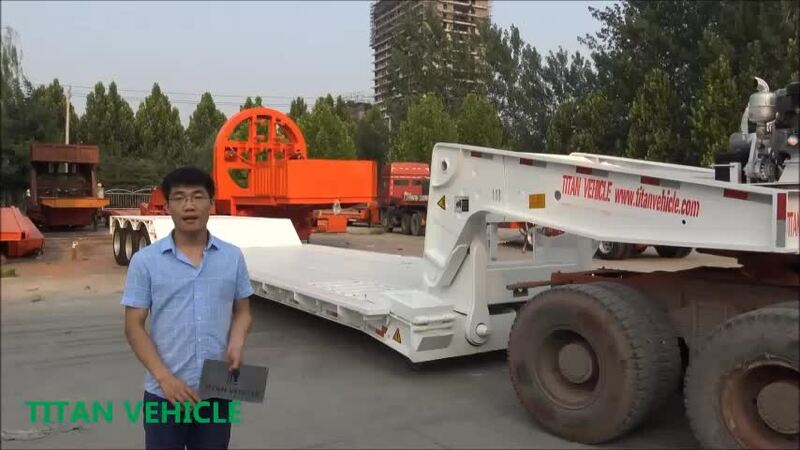 Hydraulic gooseneck lowbed trailer, easy for constrution equipment like crawler climb on the deck. 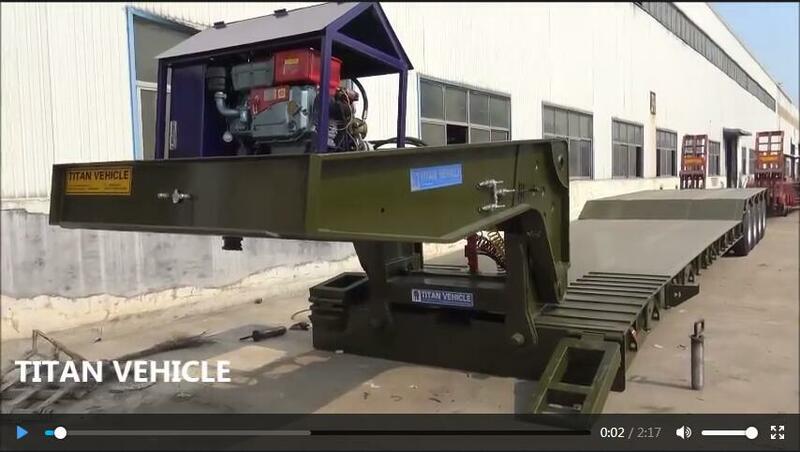 Highly robust structure steel with tensile and durable construction, 100 Ton loading capacity. 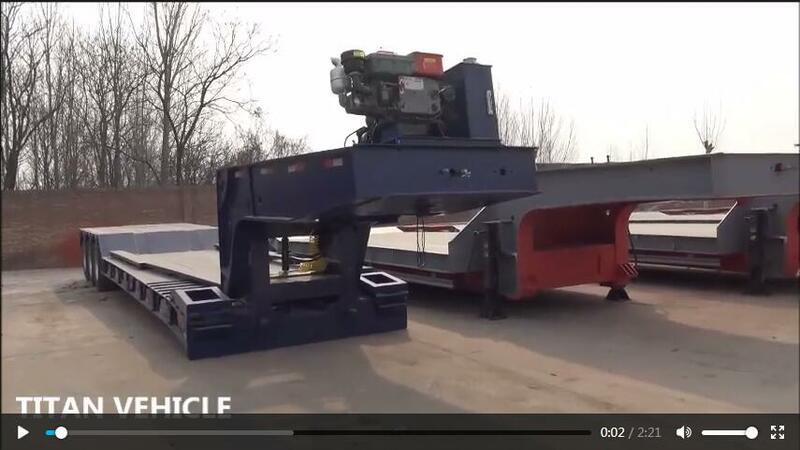 The working platform is as close to the ground as possible for transport of high and voluminous loads. 250 mm side swing bracket on the both sides for increasing the overall width of lowboy trailer. Length and width of dimensions of lowbed trailer is available custom made. 1,Titan lowbed trailer adopts HG60 high strength steel material , the yield strength of HG60 steel is more than 620Mpa, more durable and stronger than ordinary steel, and its loading capacity is 5 times more the trailer which adopt Q345 steel . 2, Titan lowbed trailer adopts 550mm main beam ,effectively increase 20% loading capacity than the normal trailer which uses 500mm main beam ,and ensure the main beam resistance to twisting forces, shock and bump, meet load requirements on different kinds of roads . 3, Titan lowbed trailer adopts 200mm width main beam ,increase 20% loading capacity than the normal trailer which uses 140mm width maind beam ,ensure driving smoothly .